The New World, 1545: Vanquished by the Spanish Empire, little remained of the Aztec and Mayan civilizations. From the ashes of their cities, a unified legend emerged: their conquerors possessed a mysterious object, an artifact so powerful—so deadly—that it came to be known as “the Death Relic." 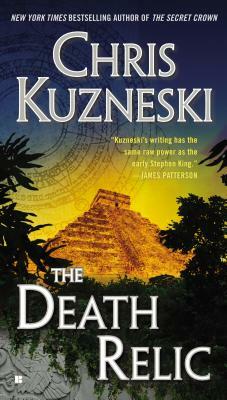 Yucatan Peninsula, present day: When Maria Pelati’s research team disappears in Mexico, she calls Jonathon Payne and David Jones, who embark on a perilous mission to find the missing archaeologists. They soon realize that Maria’s research may hold the key to solving one of the darkest mysteries of the New World. But their quest to learn the truth about the Death Relic may end up costing them their lives. Chris Kuzneski is the international bestselling author of The Secret Crown, The Prophecy, The Lost Throne, Sword of God, Sign of the Cross, and The Plantation. His thrillers have been published in more than twenty languages and are sold in more than forty countries. Kuzneski grew up in Pennsylvania and now lives on the Gulf Coast of Florida.